Coming to Thailand? Expect to use a lot of the Thailand currency. The issuance of currency is the responsibility of the Bank of Thailand. The 1, 5 and 10 satang are very rarely seen in circulation. It is very easy and convenient to exchange money at the airport in Thailand. You will find ATM's and exchange booths close to immigration and luggage claim at Thai Airports. Only change enough money for several days or until you find a foreign exchange facility which will give you a better exchange rate. Want To Use Travelers Cheques? Travelers Cheques are not very popular anymore but can they come in very handy when you are unable to withdraw money from an ATM or you lose your credit card. Make sure to follow the requirements for the promised 'money back guarantee' of the Traveler's checks company and keep track of your unused checks. It might be a good idea to carry different amounts in traveler checks. (Small and large. i.e. 20's 50's 100's) Usually you get a better rate on traveler checks but you also pay a bank fee. 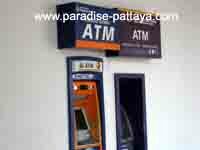 Almost all Thai banks now have ATMs and you also find them in Supermarkets and department stores. Be aware that sometimes international data networks are down and you may not be able to use the ATMs to withdraw money from your foreign or domestic bank account. It doesn't happen often but it does happen. Make sure to notify your bank or credit card company that you will be travelling to Thailand and that you will be withdrawing money in Thailand. Want To Use Credit Cards? Visa and MasterCard credit cards are widely accepted in Thailand. You should do some investigation to determine the best and least expensive method for you to receive money by using a credit or debit card based on the fees charged by the banks you bank with. Notify your credit card company or bank that you will be traveling to Thailand before you leave for Thailand. If you don't notify them they may think that money is withdrawn unauthorized and they may block your card. Always be careful when you carry cash, as you hopefully would anywhere in the world. Check with your hotel about leaving your valuables in a safe and this option is oftentimes available. It is easy to find a hotel, bank, or money changing booth that will gladly exchange your currency for Thailand currency. Or you can even open an account in one of the many banks in Thailand. Hotels usually charge you more and money changers may have a better rate than banks. So, shop around a little bit. If you are going to bring US currency (dollars), make sure the notes are not torn, in good condition and that you do not have any US 100 dollar bills in the 1990-1993 series. There are or were many forgeries of this particular series that all the banks and money changers (in Pattaya for sure) no longer accept and exchange them. Get as much practical travel information for your trip to Thailand as you can.